It's always a bad sign when the filmmakers forget to proofread the title card for a movie. 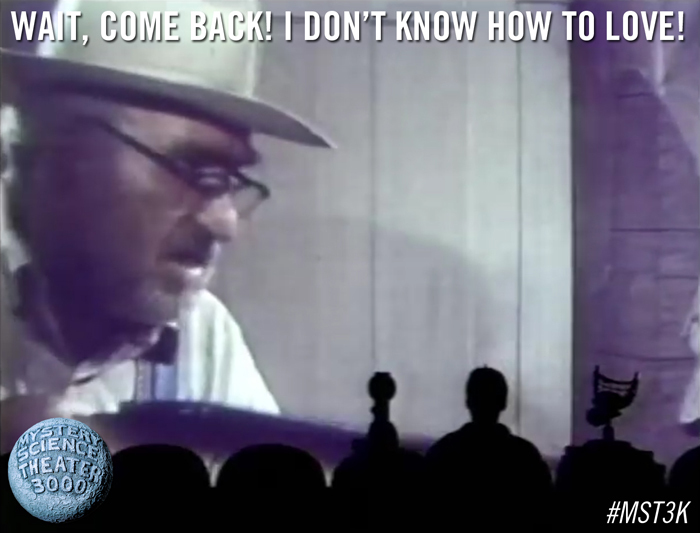 But as is often the case, a bad sign for the average moviegoer is often a great sign for the MST3K fan. So it goes with Experiment 418 - Attack Of The The Eye Creatures, where the extra "the" is an early gift to lovers of cheesy cinema and the sign of a classic episode to come. Maybe this guy never learned to love, but MSTies will always have plenty of love for forgotten cinematic classics. You guys at Mystery Science Theatre crack me up<a href=“”http://www.carpetcleaningservicesla.com">http://www.carpetcleaningservicesla.com"></a>. Thanks for the laughs. Daniel, I agree with you 100%. It would have been great to have had an official dvd! My copy has tracking issues. How I wish that there were not rediculous rights issues with this film that have prevented the episode from getting a release on DVD. This is one of my favorites. It deserves to be seen by the world. The makers of this film obviously “just didn’t care” about their end product. I wish that could be said about the current rights holder. If she didn’t care, the episode would probably have been in a box set long ago.